Micro-current treatment has been available in the U.K. for cosmetic purposes since the early 1990s with the introduction of the CACI (Computer Aided Cosmetology Instrument) which became known as the original “non-surgical face-lift”. Treatment claims include the reduction of wrinkles, an improvement in the overall shape of the face, a better complexion and improvements in the appearance of stretch marks and scar tissue. Micro-current therapy can also be used to treat other areas of the body, such as the breast. 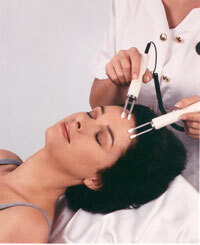 Tiny micro-currents of electricity are used to stimulate facial or other muscles in the body. The stimulation at this level is known as sub-sensory: that means that you feel very little, if anything at all, and there is no sign of any visible muscle contraction. The muscles are gently exercised, leading to an increase in the production of protein. This tightens and firms up the muscles and reduces slackness and restores a firmer shape and tone to the face or area treated. Prices usually start in the £40 - £60 range for a 30 minute treatment session. Multiple sessions can usually be bought at a discount. BioSkin Jetting is a precise, non-ablative treatment method for targeting lines and scarring using a medical technique called subscision. BioSkin Smoothing uses electrical micro-current in addition. The controlled trauma caused initiates a healing reaction and the formation of new collagen to minimise the imperfection. Micro-current therapy, like Botox®, and lasers, is yet another example of a procedure which began as a medical treatment, but which has now been adapted for use in the cosmetic market place. Originally developed in the U.S. in the late 1980s, micro-current therapy was used to treat facial weakness in victims of Bell's Palsy and strokes. Patients with muscles on the side of their faces, which had been paralysed and caused their faces to look “lop-sided”, were treated with a micro-current. This treatment seemed to “lift” their faces and their faces looked closer to their former selves again. Micro-current systems are also used to treat muscular injuries (especially in athletes) and by physiotherapists for pain relief. This treatment has been available in the U.K. for cosmetic purposes since the early 1990s with the introduction of the CACI (Computer Aided Cosmetology Instrument) which became known as the original “non-surgical face-lift”. Treatment claims include the reduction of wrinkles, an improvement in the overall shape of the face, a better complexion and improvements in the appearance of stretch marks and scar tissue. Micro-current therapy can also be used to treat other areas of the body. It can lift muscles and loose skin and different types of this therapy are currently available in the U.K.. If you are considering micro-current treatment, the following information will give you a basic understanding of the procedure. It can't answer all your questions, since a lot depends on the individual patient and the practitioner. Please ask a practitioner about anything you don't understand. How do Micro-Current Machines work? Tiny micro-currents of electricity (literally measuring only millionths of an amp) are used to stimulate facial or other muscles in the body. The stimulation at this level is known as sub-sensory: that means that you feel very little, if anything at all, when the current is applied to your skin, and there is no sign of any visible muscle contraction. The muscles are gently exercised, leading to an increase in the production of protein. This tightens and firms up the muscles and reduces slackness and restores a firmer shape and tone to the face or area treated. Some practitioners claim that micro-current therapy can also stimulate the lymphatic system, which reduces the amount of fluid in the face. This means that eye-bags can be reduced in size and the complexion can be improved. Other claims include an increased rate in the production of collagen. Micro-current therapy can also be used to treat other areas of the body, such as the breast, where it can produce a mild, transient lifting effect. What happens during a Micro-Current treatment? Careful discussions regarding your reasons for wanting micro-current treatment are vital before any treatment begins. You should also make sure that your practitioner knows what you expect from this therapy and is sure that he or she can achieve this for you. You need to talk about the type of equipment they are planning to use and evidence of good results for that particular machine are very important at this stage. A medical history should also be taken to make sure that there are no reasons why you shouldn’t undertake treatment. You may be asked to sign a consent form, which means that you have understood the potential benefits and risks associated with the procedure. 2 – 3 treatment sessions are usually recommended for the first few weeks, going down to 1 a week as the results become evident. Treatment sessions last for approximately 30 minutes to 1 hour. You should usually see changes within 4 or 5 sessions, but between 10 and 15 is the average number of suggested treatments. Monthly maintenance sessions are then suggested to maintain the results after the first round of therapy. How long will it take to recover from a Micro-Current treatment? What are the risks and potential complications from a Micro-Current treatment? There is usually no pain associated with this type of treatment, and it appears to be completely safe with no known side effects or risks. Most patients report a feeling of relaxation and an increase in energy following treatment. Since the lymph system is stimulated by the micro-current, it is important for the success of your treatment that you drink at least two litres of water every day in order to help your body flush out the toxins or poisons which are disturbed by this treatment. Who should not have a Micro-Current treatment? As long as you are generally healthy and don’t have any skin diseases or infections in the area treated, there are few medical reasons why patients should not undergo this treatment. However, patients may be unsuitable for treatment if they have a pacemaker, a history of heart problems, epilepsy or problems with thrombosis. Who can perform a Micro-Current treatment? Most machines are found in beauty salons and spas and can be used by trained beauticians and aestheticians. What is the average cost of Micro-Current treatments? Prices usually start in the £40 - £60 range for a 30 minute treatment session. Multiple sessions can usually be bought at a discount. Micro-current treatment is backed by research stemming back to the 1980s. Although the treatment is intensive and time-consuming at first, it comes with a very low risk of side effects and gives results that satisfy most people who undertake this form of cosmetic treatment. Like many other cosmetic treatments, it can also be used in combination with other non-surgical procedures such as botulinum toxin (Botox®) and dermal fillers or mild chemical peels. If you have micro-current therapy at the same time as one of these other options, the chances are high that you will be very pleased with the overall final result. However, please note that this is not a permanent treatment, and in order to maintain results you will need ongoing monthly treatments. We currently do not have any before and after images for Micro-Current Treatments. Click for ALL Micro-Current Machines clinics in the UK & Ireland registered and verified by Consulting Room. 4 out of 5 based on 7 customer reviews.